Award-winning, sustainable remediation benefiting the environment in fulfillment of two separate consent orders. The remedy for both sites was the installation of engineered barriers (asphalt, soil-geotextile, or concrete) over 60 acres; a multi-layer (HDPE liner, drainage layer, gas vents) 16-acre landfill cap and a 6-acre soil landfill cap; groundwater containment (sheet pile and slurry wall) and extraction; “hot-spot soil removal” or stabilization; drainage ditch remediation; and groundwater containment, extraction, and treatment. Decommissioning/demolition and infrastructure improvements were also necessary to implement the remedy, which included design/installation of a stormwater management system; building, tunnel, slab, and foundation demolition; deep dynamic compaction; and road construction. The groundwater containment, extraction, and treatment system design/installation uniquely encircled the entire site and has allowed for periodic use of the groundwater treatment system as long as an inward gradient is maintained. The remedial approach implemented at the site included a number of green aspects that have had positive environmental impactsby reducing emissions associated with transportation and disposal, transportation of aggregate and fill material to the site, and the creation of new green space. The reuse lessened the impact on other landfills and reduced emissions associated with the transportation and disposal of hundreds of tons of material. To accomplish our green approach we used native vegetation in the landscaping around the perimeter of the site, creating new green space. We planted a total of 177 trees, 552 shrubs, and 151 perennials and created 24 combined acres of permanent green space over the two landfills. Biodiesel was used exclusively by all the grading, landscaping, and fencing contractors. Our team ensured minimal impact to site operations, which continued throughout the remediation by avoiding off-site disposal of the in-situ treatment of lead- and cadmium-contaminated soil. Soil from a nearby highway construction project was reclaimed and used for the drainage layer under the landfill cap. 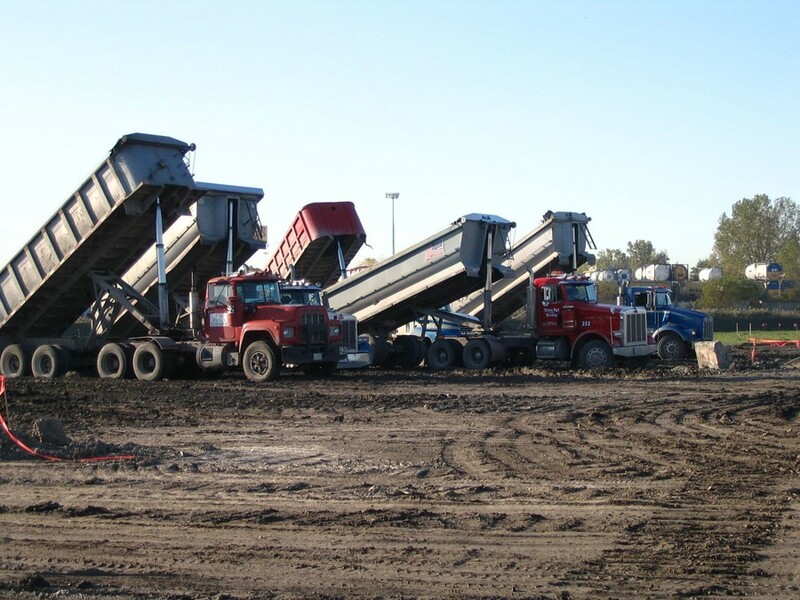 Crushed concrete and asphalt generated from on-site activities was used for grading, fill, roadway construction, soil stabilization, utilities bedding, and sub-base material. Scrap metal, including rebar, rail, stainless steel, cast iron, fence/wire, copper, and lead was removed and recycled. Reclaimed asphalt millings from a local road resurfacing project was used as sub-base material and for temporary road repairs. Sand from a local dredging project, scheduled for disposal at a landfill, was reused as fill around underground utilities and for pipe bedding material. To address the groundwater, we installed 118,800 linear feet of a sheet pile wall and slurry wall with an engineered barrier instead of a traditional slurry/collection trench. This approach eliminates continuous pumping and treating of groundwater, requiring only periodic operation that drastically reduces the energy and long-term operations and maintenance (O&M) costs. The entire existing facilities’ operating plan and necessary O&M were modified to include long-term conservation and stewardship. Remediation work was closely coordinated with the two active facilities to ensure operations were not impacted.